There are a few of his MANY episodes on your tube - Just click the image. Ok- this man is very special to/for me - I met him right after I had come off the road - performing music for 15 years, and gotten married, settled down - kinda - and began my own technology company called, simply enough, Partin Technologies. I advertised my satellite tv systems on his show which had just started broadcasting not only locally in Central PA on WGCB TV Red Lion, PA- but on Westar 4 - so the show went national waaaaaay back then....I actually got my first TV experience co-hosting and then guest-hosting the show when Bob's throat cancer came back. Unfortunately that time around he did not beat it. Now I am keeping the E.t. Monitor torch lit for the truth of this 21st century. He had an extraordinary experience back in the late 50's that changed the direction of his life forever - he and his wife Lucy manned this show, E.T. Monitor. 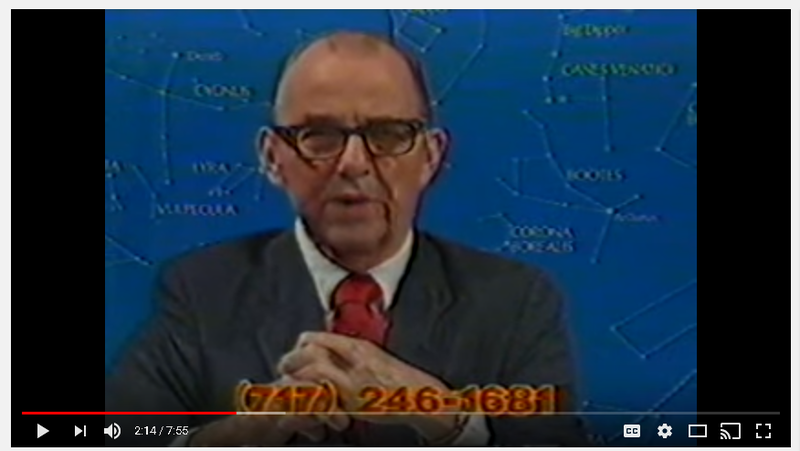 He was offering Cosmic Disclosure before anyone - including Art Bell! Here is a whole page on youtube to check out excerpts of his old show. It is nice someone still had VCR recordings to share. Click here.